In case any of you law students missed it, with all that studying you are doing, “The Simpsons” premiered its 500th episode last Sunday. Along with all the regular characters we have come to know and love, the episode also included the voice talents of the infamous Wikileaks founder Julian Assange. Now in its 23rd season, “The Simpsons” has not been the longest running comedy series without any legal issues, one of which involved a potential lawsuit from Brazilian officials for its depiction of Rio de Janeiro in the episode “Blame It On Lisa.” The Executive Producer James Brooks later apologized for the show’s depiction of the city. However, the show’s most recent legal issue, and potentially continuous battle, came out of its contract re-negotiations for its main cast members in late 2011. This was not the first time cast members vied for larger salaries, or to keep their already high ones. The first big contract negotiation began in the late 1990’s, several years after the show’s advent in 1989. In 2011, however, the main character voices would not be the only ones potentially receiving a pay cut. 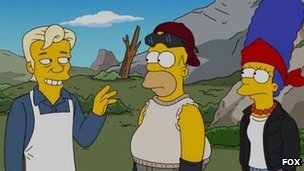 According to Fox, it would be unable to produce “The Simpsons” under the current business model. The network called for a 45% reduction in the voice actor’s current income at the time of about $400,000 per episode. Despite the negotiations almost costing “The Simpson’s” 24th and 25th season, a deal was reached for an undisclosed reduction in the voice actors’ pay. Fortunately, the negotiations have assured a continued run of “The Simpsons” for the next two seasons. Although its ratings from the current season are down 14% from last year, one cannot discount the many pop-culture contributions the show has provided through out its tenure, including the inclusion of Homer’s famous catchphrase “d’oh!” in the Oxford English Dictionary.